In Honor of Bastille Day, Some Rose of Versailles! 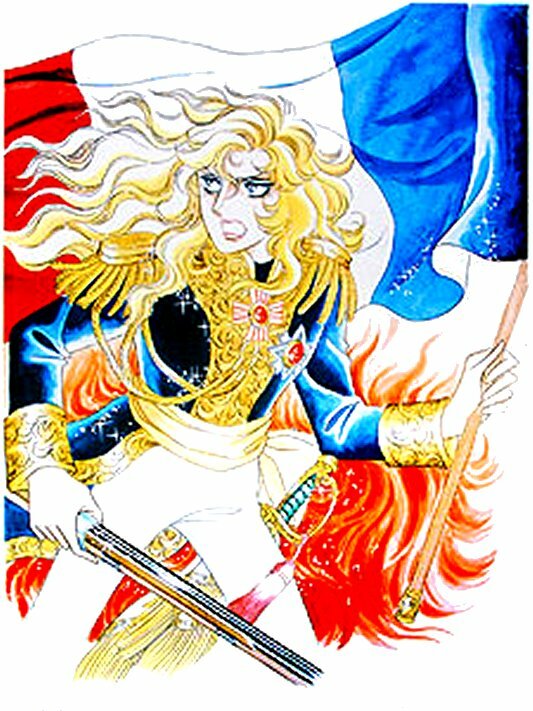 I fell in love with the 1970s historical anime Rose of Versailles (also known as Lady Oscar) when I was still in grade school. It's definitely on my top ten list of the greatest anime of all time. The plot basically revolves around the daughter of a general who--unable to bear a son--decides to raise his daughter (whom he calls Oscar) as man so she may eventually take his place as commander of the royal guard. She ends up becoming a bodyguard to young Marie Antoinette, her journey beginning with strong admiration and utter loyalty to the French crown but ultimately ending in a bloody fight for the future of the French people. Along the way the story takes us through political intrigue, women's studies, military history, famous scandals and forbidden romances, but never without a strong sense of the struggle of each character (be they a noble or a peasant). My favorite character is Rosalie, a young girl who suffers on both sides of the coin. She lives up through her teenage years in a Paris slum and cares for her aging and sickly mother. When money runs out and no jobs are to be found, she actually attempts to prostitute herself (thankfully, she solicits Oscar first!). Rosalie's life ends up leading her to Versailles where a secret about her birth forces her to choose between living as a noble or finding her own way as a peasant. She is a very dynamic character as are all members of the main cast, and since the story spans many years, the viewer is treated to a very thorough--albeit fictional--historical account that touches on life before and after the French Revolution. Posted by beata-beatrixx at 4:27 PM 1 comments/comment? Despite completing an enormous senior thesis on Columbia and Columbianism in American national art and propaganda, I give you this Independence Day greeting. Because whoever that is is freaking FABULOUS. Makes me want to get into Lady Oscar garb. Posted by beata-beatrixx at 12:00 AM 0 comments/comment?